The Real Threat to Minorities is the Ultimate Inversion! The way I see it, the smallest and most endangered minority in America is the individual. It clearly follows then that, those who work to deny an individual’s rights cannot truly claim to be defenders of minorities! Individual rights (or inalienable rights) are not subject to a public vote; a majority has no right to vote away the inalienable rights of a minority; the political function of “a right” is precisely to protect minorities from oppression by majorities … and as I stated earlier … the smallest minority on earth is the individual. These days, liberals make a concerted effort to obliterate this point, so it cannot be repeated too often that the Constitution is a limitation on the power of the government, not on private individuals. The Constitution does not restrict the conduct of private individuals, it only restricts the conduct of the government. The Constitution is not a charter for government power, but a charter for the citizen’s protection against the abuse of government power. 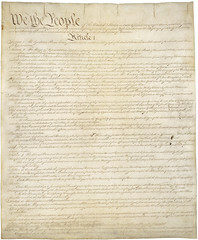 In my opinion, this is the driving force behind the progressive-liberals discussions of the Constitution needing to be a “living document”, the continuous attacks on the 2nd Amendment, willingness to overlook NSA abuses of power, and even the statements that the Constitution is obsolete and should be thrown out … it stands in opposition to their goals! If the 2nd Amendment can be removed … how long before other amendments will also be removed? Obama’s administration assured Americans that the NSA scandal was a non-issue and that there were minimal instances of spying on “innocent” Americans. Obama stated that over 50 terrorist attempts have been thwarted because of these same NSA spying efforts. However, a document leaked by Snowden to the Washington Post proves that this is far from an accurate portrayal Actually, since 2008 (which coincides nicely with the Obama presidency … coincidence? ), thousands of incidents of the NSA spying on innocent Americans occur yearly and the “secret” FISA Court, in reality, … has no control over the NSA. Can you name any of the 50 thwarted terrorist plots? Senator Patrick Leahy, a Democrat, expressed real concern that he sees no evidence of any terrorist plots being thwarted by spying on innocent Americans. Isn’t it odd that while Bush was in office, the liberal minions were screaming hysterically about abuses of government power over the very same type of NSA activities. These activities have been greatly increased under the Obama administration, yet now these minions are strangely silent. Snowden, in spite of the fact that what he did was wrong and illegal, may turn out to be a hero. Progressive liberals know that there is no real way to “rule” innocent men. The only real power any administration has is the power to crack down on criminals. So, when there aren’t enough criminals to make controlling their subjects feasible, a corrupt government will simply make innocent men criminals by declaring so many things to be a crime that it becomes virtually impossible for men to live without breaking some law. The goal of the progressive-liberals, as history clearly shows us, is to force this country into big government welfare by a series of slow working, barely discernible, yet specific measures: enlarging the power of the government a step at a time, never permitting these steps to be summed up into stated principles, never permitting their true goal to be identified, and ridiculing or demonizing free Americans who stand up and called them on it. Their plan is for a socialist big government nanny-state to prevail … but not by choice (as in votes) or by violence. They are quietly working to achieve their goals by a long process of deceit, evasion, and epistemological corruption; leading to an eventual “done deal.” ObamaCare, Fast and Furious, Benghazi, assaults on the Second Amendment, and the current NSA scandals are perfect examples of this plan in action. Obama lives like Joseph Stalin while freedom-loving individuals, labeled “deniers,” are ridiculed, spied upon and made targets of government oppression. The sad thing is that many Republicans, like John McCain, Chris Christie, and John Boehner, are party to the plan because they actually see themselves as part of the new American Aristocracy … and not as freedom loving individuals! The goal of every freedom loving American must be to stop them … period! I asked a liberal co-worker once, “what my fair share of his pay check was!” He laughed it off, but clearly was not happy with my question. Hard-working “A” student were once asked if they would share their A’s with those that got C’s … so everyone could get a B. They were not to happy with the idea! Seems it never hurts when it is someone else’s money in question! Obama and his cronies’ political ideology survives by looting (spun as “taxing the rich” and “getting your fair share”), but a free country truly survives on production. Look at our history objectively! America’s great abundance was not created by public sacrifices to “the common good.” This is simply a silly fairy tale! America’s success and greatness was created by the productive genius of free men who pursued their own personal interests and made their own private fortunes. They did not starve the people to pay for America’s industrialization like Obama is doing. They gave the people better jobs, higher wages and cheaper goods with every new machine they invented, with every scientific discovery or technological advance created. Because of this, the whole country moved forward and profited … and we were not suffering, every step of the way under burdensome taxes and regulation. Yes … some people were richer than others and some were even down right poor! Can you point to any other nation were that situation does not exist? Can France, Russia, Sweden, China say they have no poor people? Did they ever achieve the economic greatness of the United States? No … they did not! We are fast approaching the stage of the ultimate inversion: the stage where the government is free to do anything it pleases, while the citizens may act only by permission; which is the stage of the darkest periods of human history, the stage of rule by brute force. Freedom is truly the first necessary requirement of “the common good” … America’s real achievements rested solely on that foundation in the past and could not have existed without it. We need to restore real freedom if we are going to have a future! The more time passes and event unfold, the more this seems accurate. Witness John Kerry signing the unconstitutional U.N. arms treaty, look at McCain siding with Harry Reid to force through ObamaCare … a law that a solid majority of Americans do not want. Award Winning Author Gives Serpents Underfoot Five Stars! Water: How Important is it to You? A guide to positive life transformation!